Abby the Librarian: Calling all Harry Potter Fans! Did you know that Harry Potter and the Deathly Hallows comes out in paperback on July 7?? Harry Potter and the Deathly Hallows is a breathtaking finish to a remarkable series. The final chapter to Harry Potter’s adventures will be releases in paperback July 7th! It all comes down to this - a final face off between good and evil. You plan to pull out all the stops, but every time you solve one mystery, three more evolve. And because I know there are so many Harry Potter fans out there, I was so pleased to partake in this HARRY POTTER GIVEAWAY! To celebrate the release of the 7th book in paperback, Scholastic is giving out prize packages of the 5th, 6th, and 7th books to five lucky winners! That's right! Five of you will win a prize pack containing a copy of each of the last three books in the series. Have you reread them so much that your copies are falling apart? Know a kid who's just getting into the series and needs the last three books? Or maybe you took advantage of your fantastic local library to read the series. Or maybe you work at a library or school that could use an extra copy of the last three books. Enter this giveaway by leaving a comment on this post. If you link to this giveaway somewhere, add an additional comment for an extra entry! The contest will run through July 7 and I'll draw five winners (FIVE!) on July 8. Fantastic Giveaway! And those are just the three books I need to finish my set! You rock! I hope I win! This is a great giveaway! Libraries can never have too many copies of the Harry Potter books! Awesome! My school library definitely still needs the last book in the series and the others are falling apart. Great giveaway! Our brand new school library media center could use more copies of Harry Potter. Thanks for organizing this wonderful giveaway contest. This is an amazing contest! Please include me too. There's no rule that says that people who enter this contest at your site can't also enter it on mine! Same giveaway, another chance to win! Excellent! I am dying for more HP! Add me to those who would love those copies. My school's library copy of # 5 went missing this year, and the extra copies of the last 3 would be great. We've had many donations of the first and second books, but are lacking in the end of the series. We also have no buget for adding new books :-( Thanks for your consideration! Great contest! Add me to the list of people who would love to be the winner of your Harry Potter paperback copies for my library. Would love to get the last three books. Then I would have to start at the beginning and read them all again....always have to have a plan for worst case scenario....which for me would be not having a library card! Thank you for the give away! I still haven't read book 7, and I'd really like to. Awesome giveaway! Would love another copy for our library! What a neat giveaway :) I work at a prison library, and we are only allowed softcovers, so the inmates have been chomping at the bit for the 7th Harry Potter to come out in paperback...Here's hoping! I would love to win these to gift them to my now 13 year old nephew. We have enjoyed reading the Harry Potter books together and we are just finishing book 6. WE borrow them from the library. This would be fantastic. Ahhh!! I have all of the books except for the 6th one :( I really want to win this!! i love the books but have not been able to pass them on to the kids in the family becuase i like to reread them...if i win, i could give them away to one of the kids who has not red them. I'd love those books - I haven't bought any of the series (I got them from the library), but I'd like to have them for when my daughter is old enough to read. Then I would have to purchase the rest! I would be so great to win these! We love Harry Potter! Oh, oh! I'm missing both book 5 and book 7, and I promise to give my copy of book 6 to the library if I win! Now this is an awesome giveaway. I would love to win. Please enter me. I love Harry Potter books! They'd be great for my classroom library! This is such an amazing giveaway!! I would love to win! My whole family are Harry Potter fanatics! We've read them all so far and seen every movie, can't wait for the next movie and book! This would be fabulous! Would love to win this! My stepdaughter is THE ultimate Harry Potter fan. This is a fantastic contest that I would really like to win. Please enter me. My son would love to have these for his collection. Thanks for the wonderful giveaway. Thanks for the cool giveaway. I haven't had the chance to read any of these 3 books! I really need to! What a great contest-My kids who are homeschooled would love this! What an awesome competition! I'd love to have these for my children's library in IL. You can never have too many Harry Potter books! Can't wait to hear that my name has been drawn for free books! I'm a children's librarian in Ohio and so enjoy your blog! 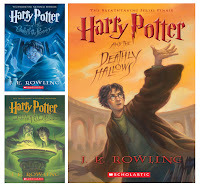 My son is just starting the Harry Potter series and would love it if I won these for him. Please enter me. Please enter me. I've loved HP for about ten years now and I would love to win these. What a great giveaway!!! I'm entering for my library - this would be a great summer reading prize! I'd love to win these books for my two sons. Thanks. Add me to the list! I'm most definitely a Harry Potter fan. Awesome. I just discovered your blog and it has some great stuff for new librarians! I love this series, and that my daughter is old enough to read them now! We don't have those last 3 books, so I would love to win! I'd love to be entered. It's about time I got all the books to add to my library! I would love to win these books. Thanks for the chance! Oh, I would love to win! I haven't read these, but I have them on my TBR list!